In 2006, over 560,000 Aboriginal children and youth under 25 years of age lived in Canada. The greatest number of these children and youth lived in Ontario (105,205) and many others lived in Manitoba (90,360), Saskatchewan (78,680), Alberta (94,805) and British Columbia (90,065). Fewer Aboriginal children and youth lived in the Atlantic provinces. 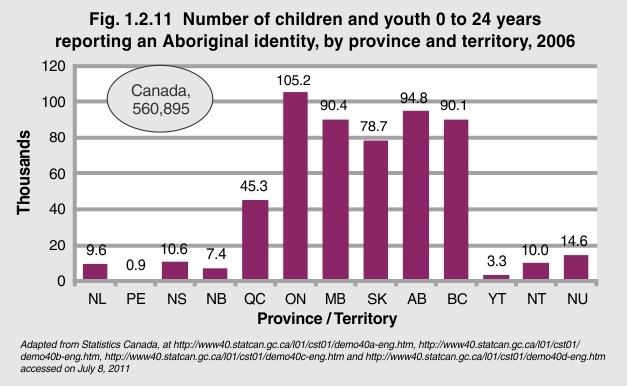 Although the total number of Aboriginal children and youth in the territories appears low compared to some provinces, the proportion far exceeds the proportion of non-Aboriginal children and youth in the territories.